14th generation Champagne house from Bouzy, specializing in Pinot Noir-based Champagne. 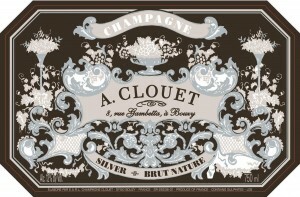 The famed Andre Clouet 1911 is their flagship Champagne and only 1,911 bottles are produced every year. It is a blend of 3 consecutive vintages. Jean-François Clouet, who was born and raised in Bouzy, still lives in the 17th century village house built by his ancestors. As his family were the official printers to Louis XV’s Royal Court at Versailles, Jean-Francois takes great pride in his family lineage. He is also well aware of the influence his family has contributed to the grand and tumultuous history of the region. Acknowledging the privilege and significance of his standing, he strives to continually improve upon the estate and wines by drawing from its past as well as implementing changes that ultimately improve the quality of his wines. The domaine’s 8ha (20 acres) of Grand Cru vineyards are situated in the coveted middle slopes of Ambonnay and Bouzy. They make a full range of Champagnes, culminating in the glorious Cuvée 1911, which is comprised of 100% Pinot Noir from Clouet’s ten best lieux-dits in Bouzy. The production of each successive release is limited to 1911 bottles.